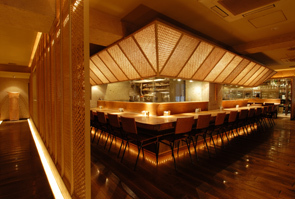 Enjoy soba noodles smoothly and stylishly at lunchtime, and lift your soul with sake at night. DAIAN is your place for soba. One minute on foot from JR Shinjuku Station.Enjoy a special time for adults in a relaxing private room. Yamato Chicken grilled over bincho charcoal from Kishu, a Japanese rolled omelette with fresh eggs. Finish up with authentic, delicious handmade soba noodles. Wines carefully selected by our sommelier, local sake and shochu. Ask to be seated at one of our varied spaces and rooms including a lively counter surrounding the open kitchen, the perfect counter with heart-stopping views for couples, and a relaxing private room surrounded by a soft bamboo screen. Enjoy an after taste in a smart restaurant with the mellow sounds of bossa nova in the background. The private room is adaptable for 4 to 22 guests. In “DAIAN,” which is 100% domestically grown gen-soba is coarsely ground with a millstone. 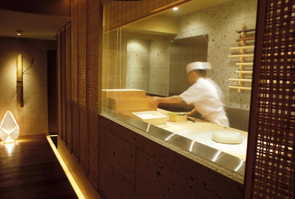 Importance is placed on soba’s original fresh flavor and ingredients are kept to a minimum of approximately 20%. Only hand-kneaded and handmade noodles are served. Enjoy the real taste of soba.